In North Shields on Wednesday (Feb 27) there is a one-off opportunity to attend a Dixieland jazz band's rehearsal session. The long-established Lazy River Jazz Band is shortly to entertain locals and tourists alike on the Costa Del Sol and North Shields' Exchange cafe/bar is the place to catch them in action before they set-off. Chris Perrin founded the band in 1983 and from its north west of England base the eight-piece - as it is likely to be on Wednesday - has played countless gigs, some of them with stellar guest names such as Rico Tomasso. Perrin (reeds) fronts the band alongside Veronica Perrin (trumpet, vocals). Chris has worked with Brian Carrick (Algiers Stompers), as has trombonist John Crisp (Carrick's Heritage Hall Stompers) who will be in North Shields on the night. Pianist Malcolm Hogarth knows New Orleans better than most having performed annually for many years at Fritzel's on Bourbon Street - he's sure to have a fund of stories to tell! 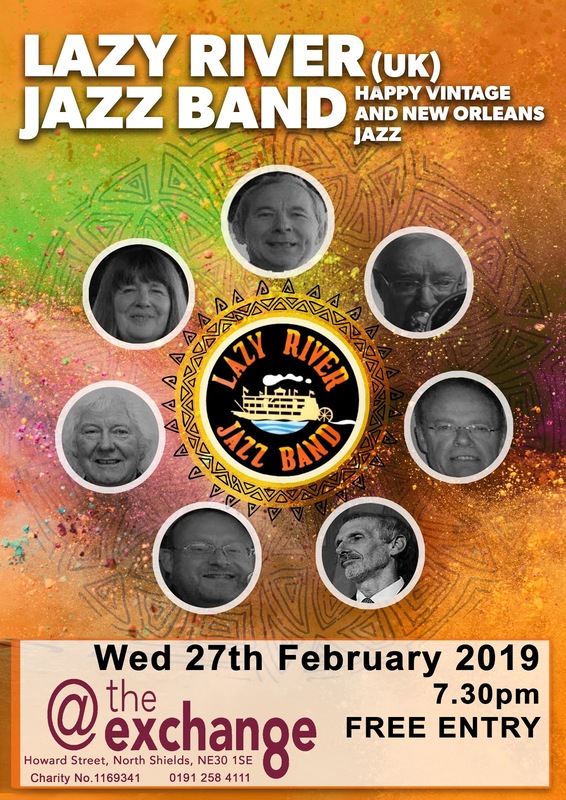 The Lazy River's rhythm section features guitarist Ian Bradshaw, drummer Ray Bowden (Andrew Hall, Algiers Stompers) and 'local hero' Phil Rutherford, sousaphone. So, Wednesday evening (7:30-9:30) at the Exchange on Howard Street (North Shields Metro is five mins' walk) is the place to be to hear a few Dixieland/New Orleans numbers (Hiawatha Rag, That Teasin' Rag and Up a Lazy River could well be in the rehearsal pad). A selection of tip-top real ales will be on offer and, what's more, it's free admission!